Moms are the masters of wearing all the hats and juggling all the balls. They need a simple skincare routine for busy moms that performs and keeps them from feeling (and looking) run down. Throw in luxury skincare products that are affordable, and you’re really batting a hundred. It took me years after the birth of my kids to figure out what my new skin needed. Some products left me feeling dry, others greasy. My entire body chemistry changed after my second pregnancy, including my skin. By accident I stumbled across a discussion at work where women were sharing their favorite products. Everyone was recommending the same things, and it didn’t matter their skin type. Related: What are the best ways for working moms to reduce stress? Finally, I thought! It’s been a few months, and I’ve added a couple products I’ve tried from working with brands as an influencer or that I received in subscription boxes. 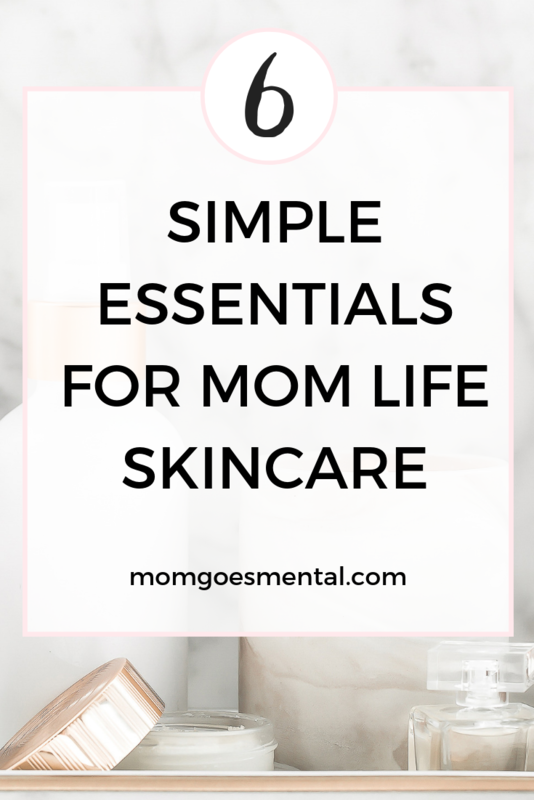 Some have gone to the wind, but these are the 6 essential products that are in my super simple skincare routine—and it’s perfect for busy moms! Though it can be somewhat of an investment, this toner is by far the best I’ve ever used. While I do use a redness fading toner from Neutrogena first, I follow it up immediately with a cool spritz of this. I’ve found that the lavender water and essential oils instantly calm and soothe my skin. I don’t know what I did before Hada Labo came into my life. I fully believe you should find a cleanser to add to your skincare routine that suits your specific skincare needs (mine is for sensitive skin and focuses on reducing redness). That being said, there are times when a skincare product seems to work for everyone. This is what my coworkers were raving about: Hada Labo! I use a few different products of theirs in a specific order right after applying my toners and allowing my face to just about dry. At night, I use them after applying my face oil and eye masks. If you have especially dry skin, adding a thicker moisturizer over the milky lotion may be helpful. I live in the south, so my skin is used to the humidity. When winter hits and the humidity drops from 100% or more down to 20-30%, Cetaphil becomes my go-to layering moisturizer for dry days. In the evenings, I add two quick steps to my skincare routine, a slow absorbing face oil and eye masks. I’ve found that both of these really need a full evening to do their magic, so I wake up refreshed with glowing skin. Bonus, it takes almost no extra time to do. VIIcode (like vee-two) sent me these oxygen eye masks to try, and I am absolutely in love. My under eyes felt amazing after using them, and in general it was luxurious to add them to my night time skincare routine. As a busy mom, it’s also important that my skincare routine be quick and easy. The eye masks go on toward the end of my 5 minute skincare routine (that’s really all the time I spend on it because momlife), and I love the “set it and forget it” application. Totally perfect for a busy mom schedule! I could just place them under my eyes, head off to bed, and wake up feeling cool and refreshed. They also include skin loving ingredients like aloe, allantoin, vitamin E which I absolutely love. Deal alert! Save $5 when you purchase these eyes masks using code Tiffany by 2/28/19. Buy it now! Because this has strict instructions not to get it anywhere near your eyes, I make sure to apply my eye mask first. Then on goes this marula oil. It comes with a dropper style bottle, and just a few drops on your finger tips gives you enough to work over your entire face. I like to focus specifically on the areas of my skin that get very dry and very oily—you know, fight bad oil with good oil. I have always wanted to try a facial mask. I have heard so much about them but never sure which one to try. Thank you for the information. I usually use toner and rice paper. I do EXACTLY the same as you – I layer Cetaphil on top as my final moisturizing layer (over a heavyish product to seal it in) when it’s really dry out in the winter! I’m also crazy about face oils & am on the lookout for new ones to try – the AYR virgin marula oil looks amazing. I’ve also heard a lot of great things about Hada Labo products but have never had the chance to try those. The marula oil was something I’d never heard of before, and I really only tried it because it came in a subscription box I received. Now I don’t know how I’d go without it! And even though it is a bit costly, it lasts forever!! The dropper style dispenser is also fantastic as keeping contaminants out so I don’t have to worry about it going bad too soon. The oxygen eye mask sounds wonderful and refreshing. My under eye area is the worst and this time of year when the air is so dry it looks like one big dark circle. I don’t have a routine for skin care but my mom does. I just think it’s so exhausting if I never see any results, that is just me though. Thanks for the great product tips! I haven’t tried any of these yet! Love getting new recommendations! These are all great ideas. I love skincare products that actually work. These sound like great products. I am intrigued by the eye masks most of all. They were phenomenal! I love being able to put them on and then go to sleep. At the end of the day, the last thing I want is a complicated skincare routine. I have heard really great things about Hada Labo. I think it’s time for me to give them a try. I love learning about different skin care products. Awesome! Think I’ll look into the evening ones. Oxygen eye mask and the oil sounds great. I would love to try those eye masks, they would be a perfect addition to my usual routine. I am very interested in the oxygen eye mask. My under eye area is the worst! I try to follow a good skincare routine. I would like to try the oxygen eye masks. Wow! I never heard of any of those products. But, I love learning about new skincare products. Thanks for sharing! Sounds great. I’ve been slacking on my skincare lately. Must try some of these products! Definitely! Let me know how you like them! The oxygen eye masks sound wonderful!